I thought I would try out the Daring Bakers Challenge. 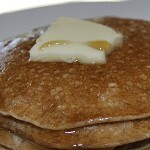 The September 2010 Daring Bakers’ challenge was hosted by Mandy of “What the Fruitcake? 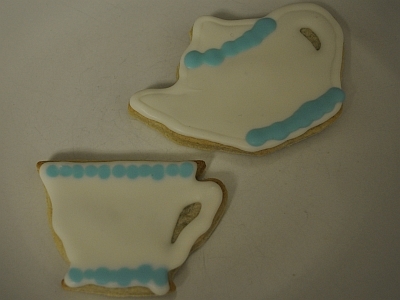 !” Mandy challenged everyone to make Decorated Sugar Cookies based on recipes from Peggy Porschen and The Joy of Baking. We were instructed to make the cookies using a “Fall” or “September” theme. Leaves sounded like the choice for me as well teapots and cups. I had to modify the cookie recipe quite a bit to enable it to taste great gluten free. I am VERY pleased with the results. In fact the recipe I will detail further down is my new sugar cookie recipe for holiday cooking and when shaped cookies are desired. I find I like them best unfrosted or frosted very sparingly…for the sake of the challenge and for all of you I experimented with royal icing and decorating. This is not something I have any experience with…so please look kindly (and not too closely ; ) at the final results. 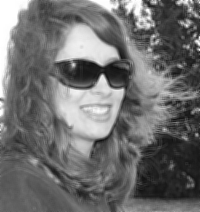 I miss my friend Jessica who used to live close enough to tackle projects like this together. 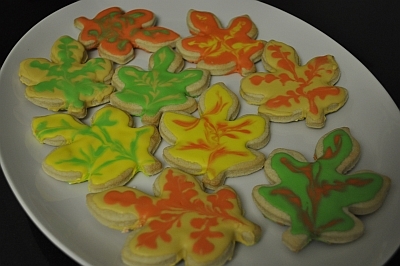 Decorated sugar cookies just begs for family or friends to collaborate/make a mess, doesn’t it? I do feel I have been particularly brave and daring. This is a longer process than I anticipated. Thankfully this recipe can be made in stages. I made the dough one day…wrapped it in plastic wrap and stored it in the fridge. 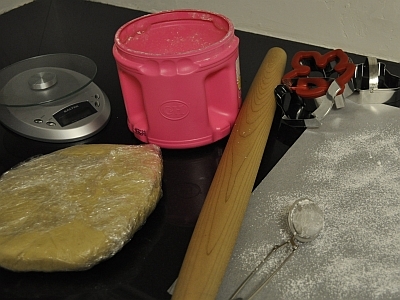 Next day I rolled and cut out the cookies using powdered sugar. I placed cookies of the same shape together on separate cookie sheets so that they would bake evenly. I refrigerated the cut cookies for at least an hour and then baked for 8-11 minutes (depending on the size of the cookies). I packaged the baked cookies in an airtight container and a couple days later I began the decoration process. I made the royal icing (flavoring with almond extract) and then colored the icing with gel concentrated colors (I bought the primary color set of 4). 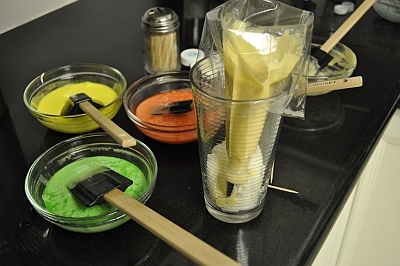 I recommend that if you are doing multiple colors that you get #3 piping tip or other tip of your choice for each color and make up all the colors before you begin decorating your cookies. 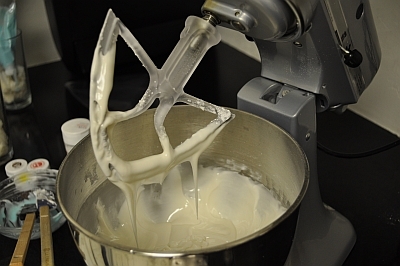 Don’t dawdle…royal icing sets up and dries rather quickly depending on the humidity in the air. 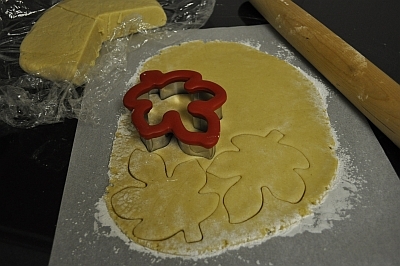 Outline the edge of the cookie and then pipe in a circular fashion to “flood” the middle. I mostly experimented with marbling. Which means that I came in with a second color while the flooding was still wet and made dots and dashes. Then use a toothpick to swirl in the direction of the leaves veins or in and up and down pattern for other shapes. I was aiming for multicolored hues of all leaves that abound in our yards and on our trees. 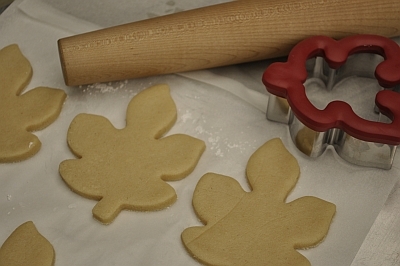 Do you have any memories of decorating cookies to share? Cream butter/shortening and sugar. Add eggs and vanilla and mix well. Mix flour with salt and xanthan gum. Add flour gradually and mix until combined. 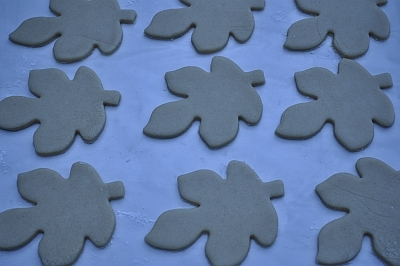 Roll out to ¼ inch thickness (or slightly thicker) and cut out cookie shapes. 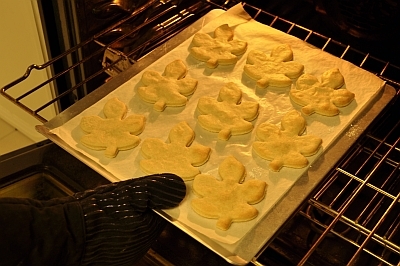 Place on baking sheet and bake at 350° for 8-15 minutes (depending on size of cookies) until golden around the edges. Rotate pans halfway through cooking time. Remove from oven when done and allow to cool on cookie sheet for 5 minutes. Cool cookies to room temperature and frost (royal frosting) / or store until ready to frost (and eat) in airtight containers. Beat egg whites with lemon juice until combined. Tip: It’s important that the bowls/spoons/spatulas and beaters you use are thoroughly cleaned and grease free. Sift the icing sugar to remove lumps and add it to the egg whites. Tip: 2 amounts of icing sugar are listed, the lesser amount is good for a flooding consistency, and the larger amount is for outlining, but you can add even more for a much thicker consistency good for writing. If you add too much icing sugar or would like to make a thinner consistency, add very small amounts of water, a few drops at a time, until you reach the consistency you need. Beat on low until combined and smooth. Use immediately or keep in an airtight container. 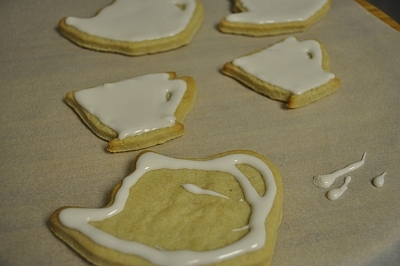 Tip: Royal Icing starts to harden as soon as it’s in contact with air. Cover containers with plastic wrap while not in use. beautiful job on the challenge! they look great! These are so pretty! You are the Martha Stewart of gluten-free!